Blood tests being very inconsistent in what they report and measure. Normal reference ranges being very wide and based on a sick population. These are incredibly important considerations when you’re told “everything is normal with your blood test” despite you feeling really unwell. “I feel crap but my blood tests are all normal” is a common sentiment echoing around people’s minds – perhaps yours. How can you feel so wretched and still have super-duper normal blood test results? But As you saw in the previous article, if you are being compared to other people who are also not well, of course you’ll appear ‘normal’. Those reference ranges are called “pathological ranges” and they’re used to diagnose disease rather than identifying metabolic imbalances that might be creating your symptoms. 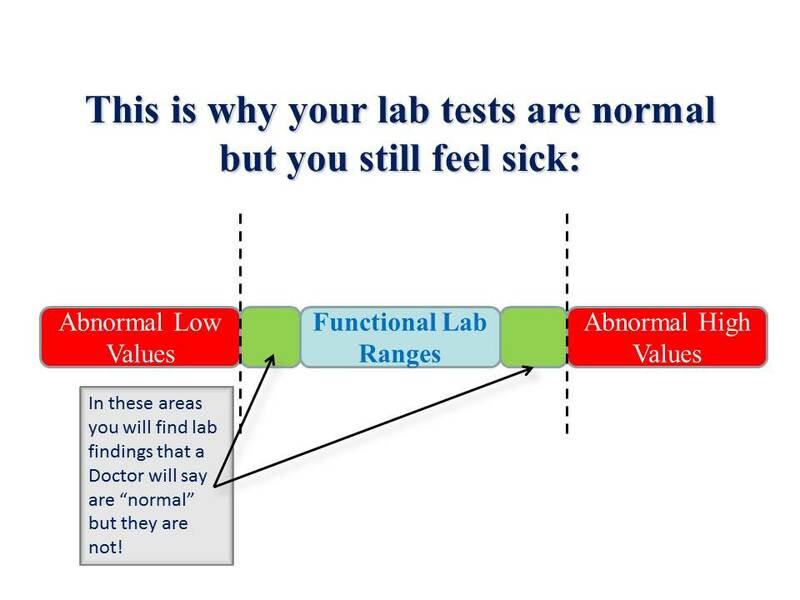 Unless you have a blood test result within which a marker (or markers) are so high or low that they raise your doctor’s suspicion that you might have a recognised medical condition (or pathology), you’ll be told you’re ‘normal’. Because you have a ton of symptoms, your body’s function (physiology, metabolism or whatever you choose to call it) may be severely imbalanced, but not enough to flag a true pathology (disease) according to the standard reference ranges. “The conventional ranges are designed to identify significant disease states and pathology. People who fall within these reference ranges are assumed to have no clinical signs or symptoms of any disease, and are considered ‘normal’. There is another method of analysis that looks at blood work from a functional, prognostic and preventative perspective and can give excellent data on how your body is functioning. By looking for optimum function we increase our ability to detect the dysfunctions that plague you long before disease manifests. In order to do this, we have to focus on physiological function as a marker of health, not the presence or absence of a specific disease. When I look at a blood test, I consider optimal or ideal ranges, not normal ones. I want to find the subclinical imbalances in your biochemistry that give clues as to what’s causing your symptoms. Look at the graph, below. You will see three colours – bright green, pale orange and dark orange. In a standard blood test interpretation, you have to fall so high or low that you’re in the dark orange in order to be considered ‘abnormal’. 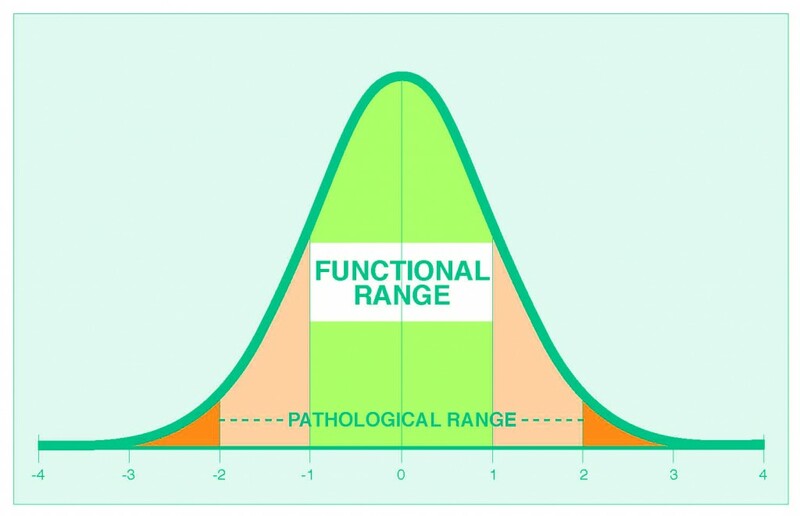 Anything between the dark orange segments is called the “pathological range”. In functional medicine, we prefer to narrow down the area considered ‘normal’. Instead, we call them ‘optimal’ or functional’. I know where I’d rather be, and where all my clients are aiming. The functional or optimal ranges (shown in bright green) are tighter than conventional ranges and enable us to find subtle imbalances that indicate altered function in your body. These imbalances may not reflect true disease, but they can explain why you’re not feeling well and be used as a preventative measure. When we see blood chemistry shifts we can conduct further detective work – assessing food diary, lifestyle, other functional tests – to stop the imbalances progressing and head disease off at the path. By addressing the cause, we produce more efficient and long-lasting results than just treating the symptom or the effect of the imbalance. How do I know these reference ranges are the real deal? We know the functional reference ranges aren’t imaginary because time and time again they match the results of other tests. Indications of B6, B12 and folate deficiency on a blood test are nearly always confirmed in organic acids and methylation tests. Signs of mineral deficiency are always confirmed in hair mineral tests and specific blood tests for minerals such as zinc, copper and magnesium. 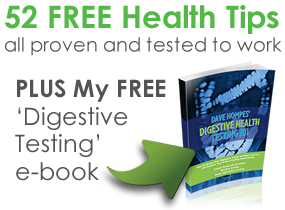 Indications of immune responses and digestive inflammation are nearly always confirmed in stool testing. Also, our clients’ symptoms and subjective experiences always match what their blood tests reveal when interpreted using the functional ranges! We don’t use a blood test on its own – it needs to be placed alongside other information to provide context and ‘the big picture;. By combining your blood test with a thorough health history, family history, symptom and diet analysis we can more accurately determine what’s going on. This rapidly catapults you into a position in which you’re no longer guessing, no longer frustrated and no longer stressed about why you’re not feeling like your true self. It may also cut disease progression off at the pass. I hope you can now see why the normal reference ranges in standard blood testing are misleading unless you have true medical pathology. I also hope you can see how and why assessing your blood test using functional ranges is so important and so beneficial. In the final post in this series, I’ll show you how we do this for our clients along with a couple of great examples. Click here now for the final post in the series.